The Imperial Collection 3-in-1 drop arm commode features arms that drop independently below seat level for safe lateral transfers. With its 600 lb. capacity, the commode is ideal for bariatric patients. 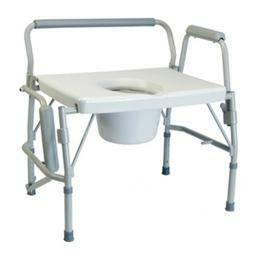 Removable backbar facilitates use as a bedside commode raised toilet seat or toilet safety frame. For additional product information, including a larger picture and further features and specifications, click on the Product Detail PDF located below, under the Additional Resources tab. Seat height adjustment range: 19.5" to 23"